In 2016, the Armenian EyeCare Project noticed an incredible need for cornea transplants among patients in Armenia. So we began a Cornea Transplant Program, asking donors to sponsor the surgery for those who needed it — a cost of $800 for one procedure. Over 70 Armenians have regained their sight through this program and there are many more on the waiting list. Below are the stories of three Armenians who have received cornea transplants because of your support, including Gagik, our youngest beneficiary yet. Gagik was only three days old when he was diagnosed with sclerocornea in both eyes, a congenital eye disease in which the corneas of the eye do not develop normally. 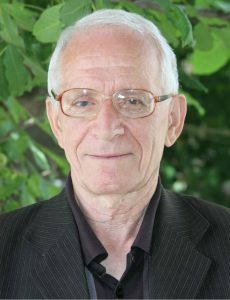 Still, doctors offered hope to Gagik’s family, explaining that there is a way to prevent blindness. “My son has the chance to see if he gets treatment!” Armine, Gagik’s mother, said hopefully. Fortunately, Gagik was able to get the cornea transplant he needed to save his sight with the help of the Armenian EyeCare Project. 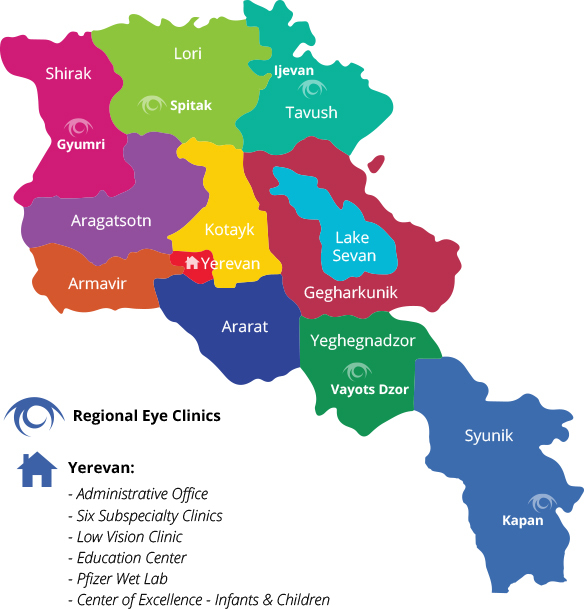 At the time, two highly skilled U.S. ophthalmologists, Dr. John Hovanesian from UCLA’s Jules Stein Eye Institute and Dr. Matthew Wade from UC Irvine’s Gavin Herbert Eye Institute, were in Armenia working with local ophthalmologists at the Malayan Ophthalmological Center in Yerevan. Thanks to the joint efforts of Dr. Hovanesian, Dr. Wade and Dr. Anna Hovakimyan, the AECP Fellow who heads the only Corneal-Uveitis Clinic in Armenia and performs the majority of the transplants, Gagik was able to receive corneal surgery on his right eye. The transplant was a success! Though Gagik is too young to identify his visual sharpness, Armine notices a big difference following her son’s surgery. “I see that he reaches out his hand for objects and recognizes them from a distance, both of which he wasn’t previously able to do,” she says. Armine was diagnosed with diabetes when she was just 12 years old. “Everything started suddenly,” she remembers. Armine had felt very bad so her mother took her to a local hospital. There, the doctors gave her a glucose injection — but the injection resulted in a coma. Armine’s mother, the matriarch of the family, did everything she could to help her daughter. “My mother was running from one hospital to another trying to find a way to save my life,” Armine says. Armine is part of a big family with four younger siblings and her mother has to work hard to provide for everyone. Once Armine came out of her coma and received adequate care, it seemed the family’s struggles were over. But five years ago, Armine began having issues with her sight. 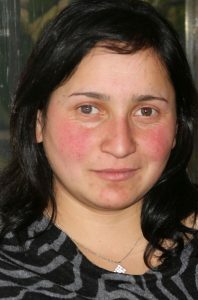 Armine had developed cataracts in both eyes. After cataract surgery, she was able to regain sight in her left eye, but still experienced vision loss in her right. A follow-up exam revealed that Armine’s cornea was damaged and she would need a cornea transplant to see again. Unfortunately, Armine and her family could not afford the cost of this surgery — $800 — so Armine continued to gradually lose her sight. Better yet, because of her restored sight, Armine can now continue on her career path and become a productive member of society. She says this is all possible because of the AECP and its donors. Amirjan has struggled with high myopia, or nearsightedness, in both eyes since he was a child. Due to the condition, he underwent two separate operations on his right eye several years ago but both treatments were ineffective. Just months after his second surgery, Amirjan’s vision worsened and his eyeglasses did not help him anymore. He was suffering from severe pain in his right eye and, in the left eye, his myopia was still disturbing him. Because of these vision problems, Amirjan had to quit his job as a furniture maker. He could no longer do the work. What’s more, Amirjan’s wife also has health problems and requires expensive medicine, which is very difficult for the couple to afford. After a detailed eye exam, the ophthalmologist recently told Amirjan that the only treatment to help his condition would be a corneal transplant. Of course, Amirjan could never afford the expensive cost. Luckily, Amirjan’s despair was replaced with joy when he heard that a donor had sponsored his surgery. Amirjan was able to receive a cornea transplant on his right eye thanks to the generosity of a stranger. If you would like to sponsor a cornea transplant for an Armenian in need, please donate to our program or contact us. It costs just $800 to sponsor a surgery that can change someone’s life. For more stories on patients who have received corneal transplants in Armenia through our program, please read our many other patient stories.